We've had so much fun designing the branding for The Little Drawer, a new lingerie boutique store, in downtown Fairhope. The store is located on 19 North Church Street (right next to the lovely Bliss Bridal) and will be opening early to mid-September. They'll be offering the finest in lingerie and sleepwear in Lower Alabama so get ready people. Like them on FB or Instagram @thelittledrawerboutique for an official countdown. Stay tuned...much more coming soon! 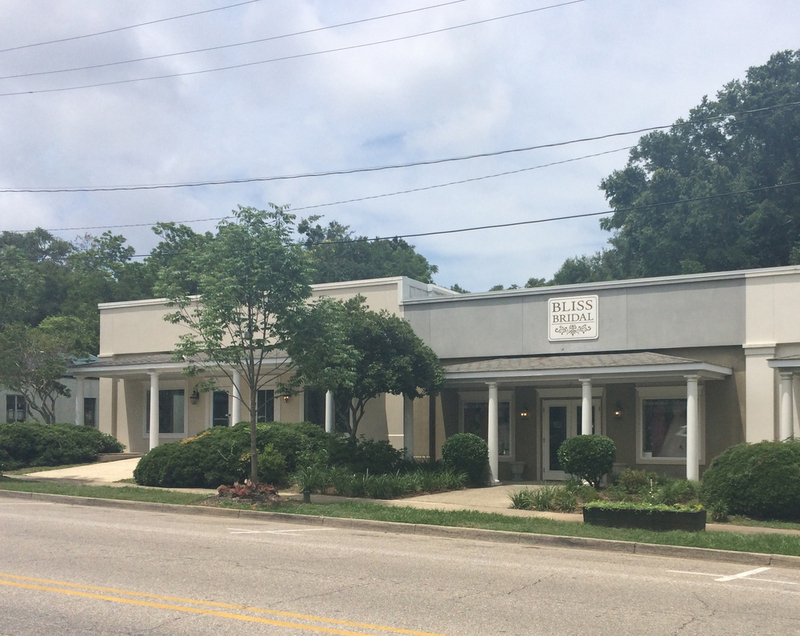 Here's the BEFORE shot (to the left of Bliss Bridal). We're working on the signage and other details of course now. 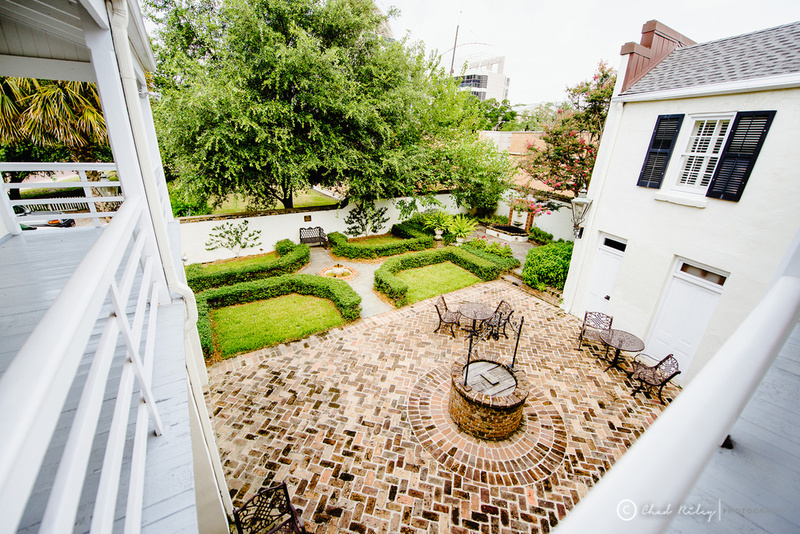 Can't wait to the share the AFTER exterior shot soon! I loved working with Katherine Bramlett Designs. 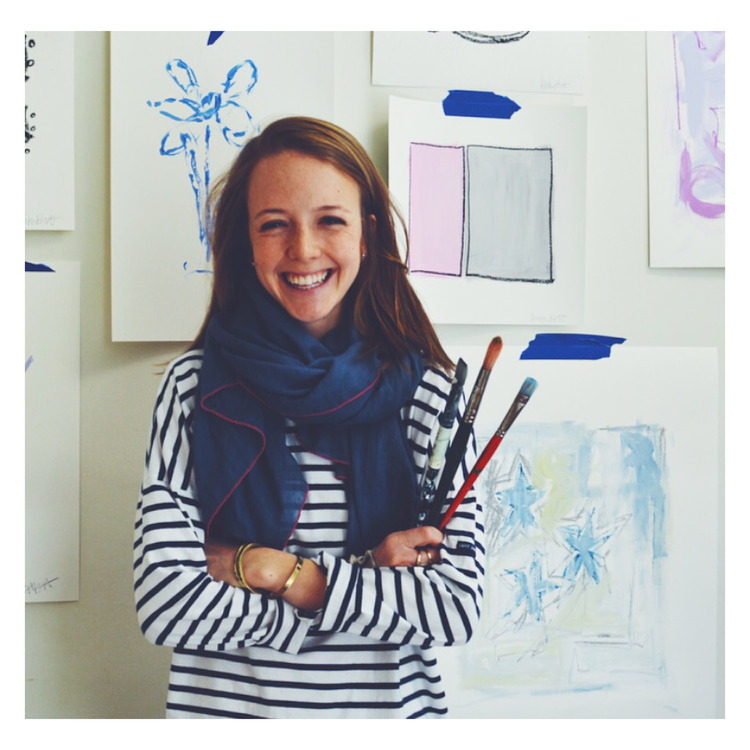 Katherine is based in Birmingham, AL and such a talented artist AND interior designer. 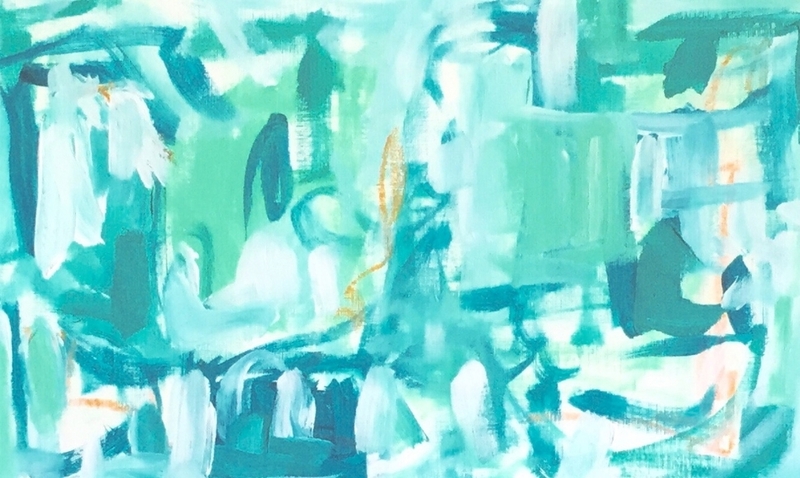 Visit her website to see more of her gorgeous work. Visit her BLOG for some design inspiration. She's always coming up with these amazing design boards and posting pictures of her beautiful work and other creative ideas. I love collaborating with other artists, and it was truly an honor to work with the talented Katherine Bramlett Designs! 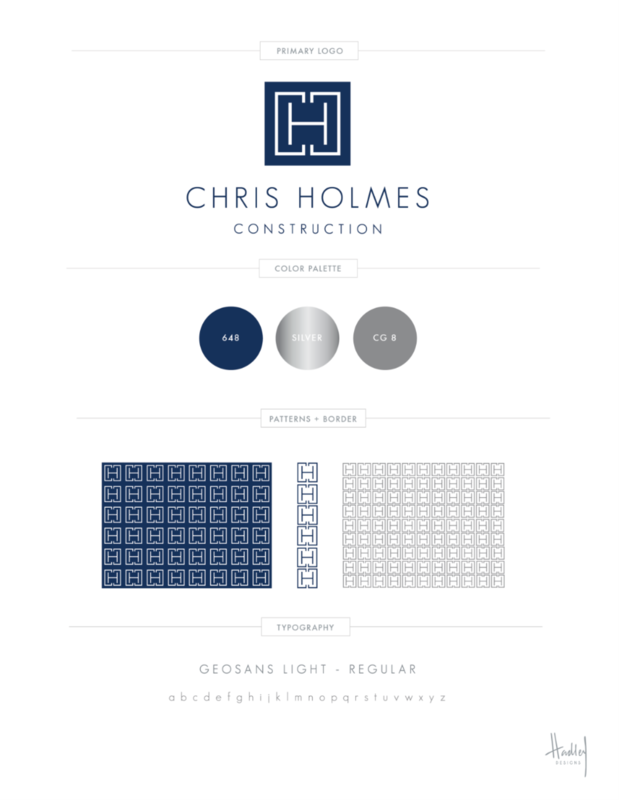 So excited to share this new branding board for Chris Holmes Construction with you. When it comes to my work, nothing makes me happier than seeing my clients HAPPY. I received both of these images this week and this is what it's all about. Thank you so much for your kind words. Making people and businesses feel professional and polished is what I strive to do every day. We sing so many of these songs every night, and I can't think of anything more special to hang on their walls than these words of truth. One of the many branding projects I'm wrapping up now. I love how this logo and branding board turned out. Stationery system is next so stay tuned. 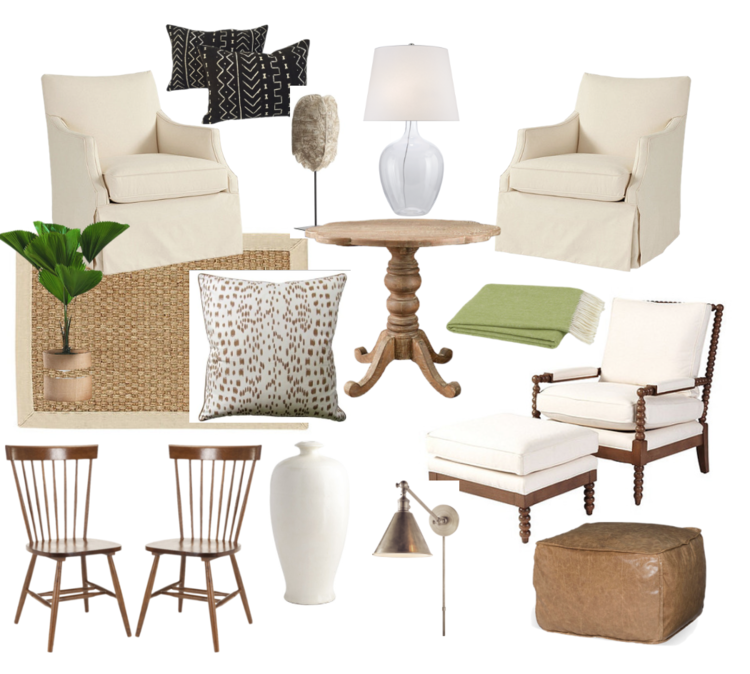 You won't want to miss Chapel Farm Collection's Grand Event! Visit www.chapelfarm.com for more info. New website coming soon! I'm so proud of my close friend, Ashley Dukes, for making her ideas and dreams come true. Wire Road Outfitters was inspired by her father's favorite place, Auburn, Alabama, and is a classic clothing brand created for fans that never stop fighting. There's much more in store for Wire Road Outfitters, but for now, you can buy these comfy t-shirts (they're the good, soft kind!) at McCoy Outdoor Company in Mobile, AL. I'm so excited to share this new branding board with you! I collaborated with Graphic Designer, Laurie Kilpatrick, on this project and we were so pleased with the outcome. 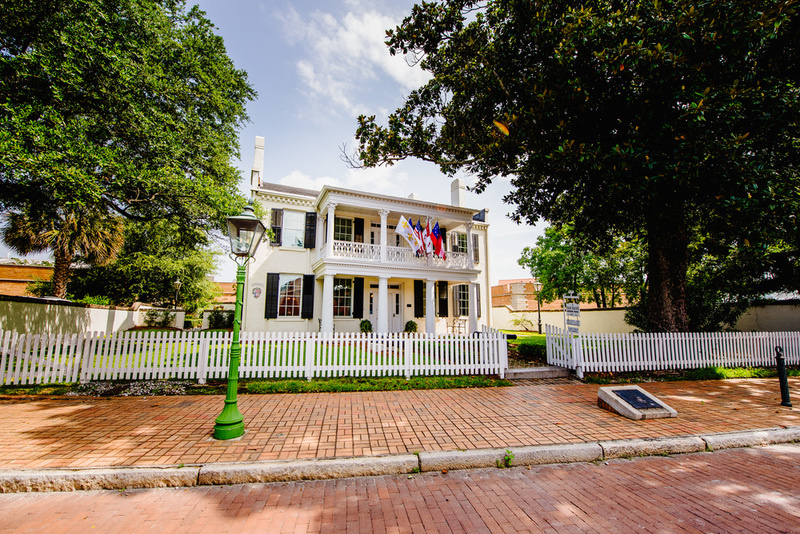 Here are some beautiful shots of the museum by Chad Riley Photography. We have many more exciting plans for this museum so stay tuned! 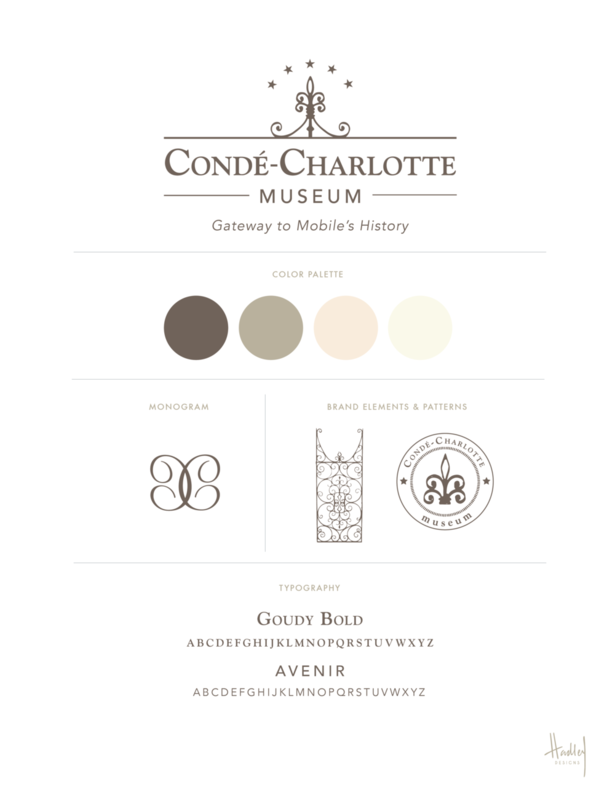 To find out more about the Conde-Charlotte Museum call (251) 432-4722. Website coming soon! In the meantime, check out their facebook page. New website coming soon, but for now, like the Love Mobile facebook page. And thank you to Brad Goode for your incredibly kind words. Brad is the genius behind LovMob and our wonderful preacher at Dauphin Way United Methodist Church. 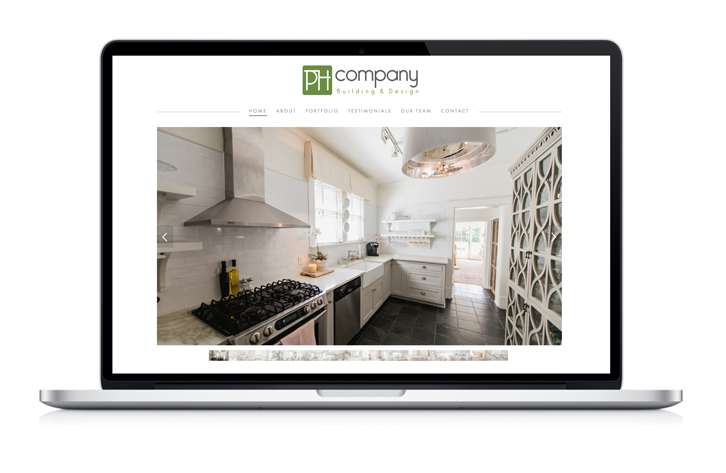 "Working with Hadley has been amazing from start to finish. We had an extremely tight deadline and Hadley was able to deliver the perfect design without compromising quality. She met with us personally and took the time to really understand what we wanted, not just what was easiest for her. 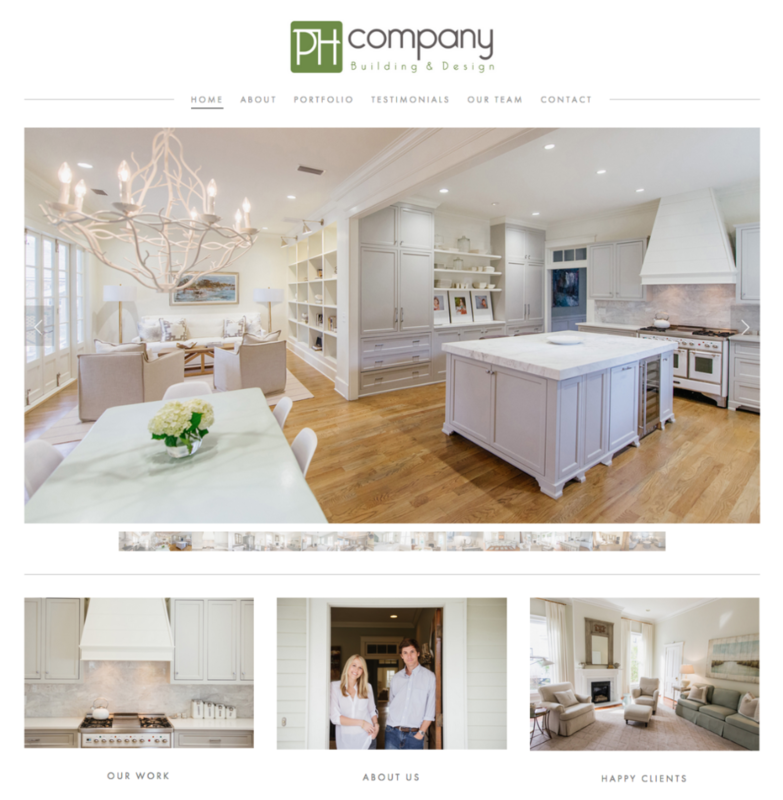 I have worked with many designers who expect me to know as much about design as them, Hadley was able to speak in terms we understood and brought our vision to life perfectly. We had a very small budget for our project and our investment in the right branding upfront has been worth every penny spent. Hadley is a professional with grace, humility, patience and a first-class eye for design"
Check out the new branding and marketing/ad campaign for Mobile Pediatric Dentistry. I'm so pleased with how this turned out, and Dr. Stephen Greenleaf's new office is so bright and happy. I mean, gone are the days of dreading the dentist! He has an awesome playroom/game room and kids can watch movies when getting their teeth cleaned. Calder will be visiting very soon for the first time (insert sigh) but I can't think of better place (or person) to take her to than Dr. Stephen Greenleaf. He has been an absolute dream to work with, and he incorporated his new branding so well into his new office. I love everything about his new office. It's so exciting to see a branding board really come to life. All photos taken by the talented and fabulous Devin Ford Photography. We just finished the new branding for Lulu & Me, which is a fabulous home and fabric store in downtown Fairhope. We will update their website eventually, but for now you can visit their site here. We're also transforming the exterior of their shop too. See the BEFORE pic below. Coming soon: new black awnings with their crisp white logo, a high-gloss green door, a new sign and window graphics. I'm working on their stationery system now, as well as some other graphics now so stay tuned. Much more to come! We can't wait to share the AFTER picture with you. Finally this adorable store will look as fabulous on the outside, as it does on the inside! The University of South Alabama Children’s & Women’s Hospital hosted Local Goodness, a unique farm to table event last Sunday. It was a HUGE success, and I was truly honored to do the branding for Local Goodness and all of the design work for this event. Beth, Liz, Kristen, Abby and the entire committee were a dream to work with and we had so much fun coming up with these designs for the 1st Annual event. Given the enormous success of the event—I bet this will the first of many for Local Goodness! The event was sponsored by Hancock Bank, and guests dined on local meats, seafood and produce as they enjoyed authentic bluegrass music performed by local band Fat Man Squeeze.Because of the rain, the event was moved from the USA Children's and Women's Hospital Park to the Cruise Terminal. The committee did a fabulous job of bringing the park inside and the decorations really helped make this such a successful evening. Local Goodness will help raise funds to redesign the Evaluation Center, the emergency department that sees over 35,000 patients annually, almost 90% of them children. Local Goodness will pay tribute to local cuisine, art and music while raising awareness and support for the hospital’s mission of providing the highest quality healthcare for the children and women in this region. 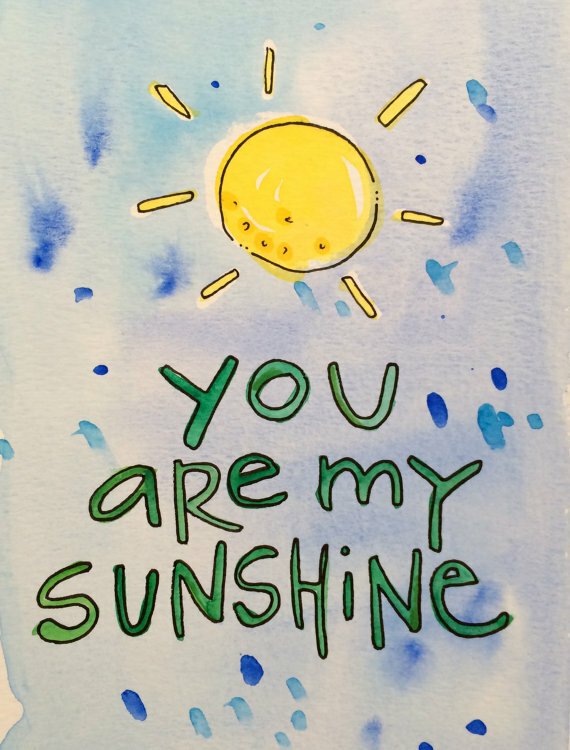 I thought I'd share these sweet words from Beth Mattei, Director of Development at USA Children's and Women's Hospital. I've been terrible about updating my website (need to that soon!) but I'll add this testimonial here for now. And thanks Beth, the feeling is mutual. Local Goodness and USA Children's and Women's Hospital are beyond blessed to have YOU! "From the moment we first met with Hadley, it was clear that she was the perfect person to create the look we wanted for our first ever signature event. Local Goodness has been a dream for a long time and she helped bring it to life. In the fundraising world, first impressions are everything. Hadley created a logo and invitation that perfectly set the tone for what this event is all about. She was able to work within a really tight deadline and still deliver a well thought out, original design. Local Goodness is a celebration of all things "local" and what a true local talent we have with Hadley." It was everything we hoped for and more. Good food. Good music. Good people and all for Good cause. Click here to learn more about the University of South Alabama Children’s & Women’s Hospital. What a treasure we have in Mobile, AL and what a special event this was to be a part of! Stay tuned. This might be my favorite website yet. Lots of fun projects going on! I just finished this branding board for Chapel Farm Collection. 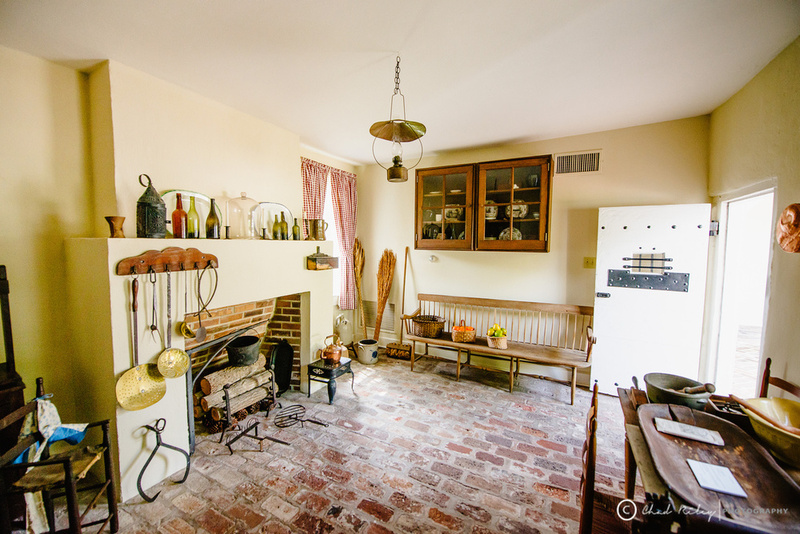 Chapel Farm Collection is a carefully curated assortment of antiques, jewelry, and vintage gifts discovered by a mother and her two daughter-in-laws. Many more details coming soon about this project and lots of surprises ahead. As a designer, there's nothing more rewarding than stepping back from a project and thinking, Wow, this is so them. After a lot of hard work and several rounds of concepts, that's exactly how I feel about this branding board. I think we finally nailed it. The "Chapel Farm" font was designed by one of the Pilot's close family friends years ago, who has since passed away. It was very important to them to integrate this font into the new design. The steeple is a replication of the beautiful steeple at Chapel Farm (see below). There are many other hidden meanings throughout the entire design, which makes it that much more special. Check out how gorgeous Chapel Farm is. The entire time I was there during our first brainstorming session, I couldn't help but feel the Lord's presence there—in a very strong way. It only seemed right that He was represented in the identity of this new business. I'm truly honored to work with this fabulous Pilot trio, Jeanna, Jordan and Brooke. Website coming soon, but for now check out their facebook page. More on this fun project and new business coming soon. Word is that they'll be hosting a show at their fabulous barn the weekend of March 14 during Fairhope's Arts and Crafts weekend. We will be some busy, busy bees until then!